3D-Oxides develops on demand novel materials with optimized properties for your applications. 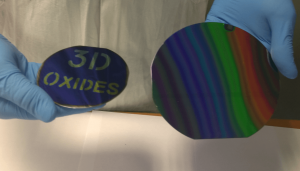 3D-Oxides further delivers a wide range of coated substrates with 3D-patterned single and multi-element oxide thin films for a wide range of applications such as sensors, bio-coatings, renewable energy, photonics, micro-electronics or for anticounterfeiting tags. 3D-Oxides has a well-established experience in material science, chemical precursors synthesis, thin films and technology intelligence.Thanks to our European network of partners, we can address complex fields requiring multi-disciplinary skills and provide disruptive solutions to your needs. 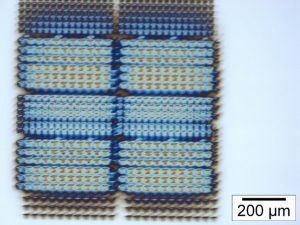 3D-Oxides, based on CBVD (Chemical Beam Vapour Deposition) equipment for thin film deposition, has developed a unique platform to achieve complex thin films. 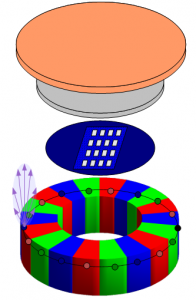 With our combinatorial approach, we can rapidly generate comprehensive material libraries and with our additive thin film growth methods address complex and unique thin films architectures.